Choose from a wide range of lagers, ales, ciders and spirits in our well stocked bar with all the usuals you’d expect plus many more. Our draught focus is One World Beers, with a nice American craft beer for those customers looking for something a bit more flavoursome. Our cask range tends to blend local breweries with a well-known national brand and seasonal favourites from Caledonian Brewery. Check out our well thought out and extensive wine list, great for pairing with food or for discovering a new favourite, or two! For coffee lovers our coffee is from local supplier, Roasted. 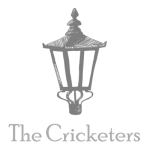 All our drinks come with a welcoming service and friendly bar staff, making the Cricketers a pretty special place to visit. Choose from a wide range of lagers, ales, ciders and spirits in our well stocked bar with all the usual’s you’d expect plus many more. Our draught focus is one World Beers, with a nice American craft beer for those customers looking for something a bit more flavoursome. Our cask range tends to blend local breweries with a well-known national brand and seasonal favourites from Caledonian Brewery.